One of the most unique spaces I’ve worked on was a beautiful loft in an historic building located in the heart of downtown Hollywood. The unit has an amazing view of the Capitol Records building and from what I hear an amazing rooftop pool as well. This project was even featured on Apartment Therapy. Our client, Daniel Lowe is an Interior Designer and he chose Hollywood Sierra Kitchens to help him with the kitchen, bathroom and walk-in closet design. He selected all the furnishing and accessories himself and did a fantastic job. 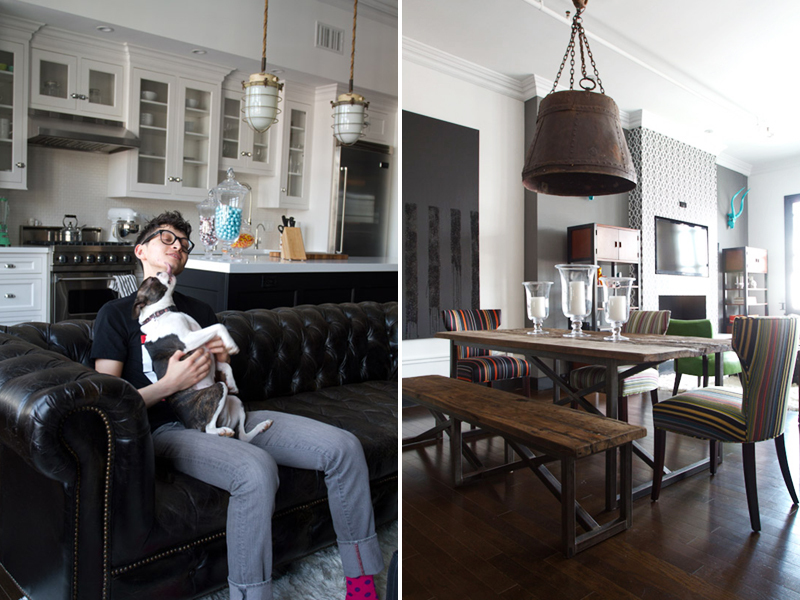 Here are some pictures our photographer, Bethany Nauert, took for the Apartment Therapy shoot. Here’s Danny with his adorable Boston Terrier. The black painting on the left side of the right photo he painted himself! I think it was very inventive to use those bistro style folding doors to separate the bedroom space when necessary. I also love the way the wall-papered mantle wall, the lime chair, and the turquoise-painted antler heads give a nice contrast and punch to an otherwise neutral space. The Kitchen was really a “galley” style, and the back wall had a Viking stainless steel refrigerator, a Viking range and hood, a Rohl apron front sink and a Dornbracht faucet. 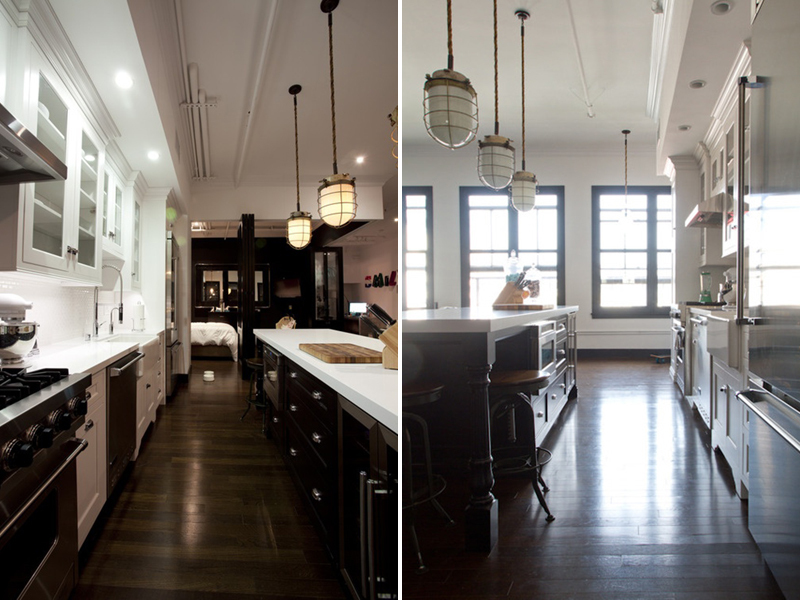 Here are two side views of the kitchen with the beautiful industrial looking pendants that Danny selected, both on and off. The cabinetry is flush inset with an arched bracket foot detail at the sink base and glass inserts in all of the frame-only doors. Danny choose to do the latch hardware on the wall cabinets because he wanted a “New England” feel. The small scale white subway back-splash tile is from Waterworks. These shots show the side of the island which had a wainscot end panel and base molding.The appliances in the island are a Viking microwave drawer and a stainless steel beverage center, along with a three drawer base for storage of large pots and pans. The bathroom has two under-mount Ladena sinks from Kohler with wall-mounted faucets from Waterworks. The cabinetry is flush-inset with a paneled drawer design, accented with chrome bin-pull hardware. We integrated posts/pilasters into the vanity design to give it a free-standing, furniture-like quality. The closet was done in a high gloss black finish with polished nickel knobs. The door panels were frame-only with antique mirror inserts, which are also featured in the wainscot panels in the building’s elevators. What do you think of the space? Wouldn’t it be fun to live in a bachlor-pad type loft like this?! ;) You can check out the rest of the pictures on the Apartment Therapy website.